Trade shows are one of the best ways to get your brand and products in front of new markets. Unfortunately, because trade shows are a live event, you’ll only have one chance to make the most of the opportunity. If you’ve been thinking about getting involved in trade shows but weren’t sure if the pros will outweigh the logistical headaches, read on to learn more about the benefits of trade shows. Trade shows can bring your business to a national audience. While not every attendee will have the decision-making power to invest in your product, a large percentage will have the authority to make deal-making and purchasing decisions. This means that when you go to a trade show, you can count on making face-to-face interactions with someone who could become an important business connection. Nearly 78 percent of trade show attendees come from over 400 miles away, so you can trust that you will be able to reach new markets and build national brand recognition. This is especially helpful for small companies and startups who want to get in front of a broader audience but don’t have the budget for a national marketing campaign. 99% of trade show attendees have reported that expos provide a unique benefit that other marketing methods simply cannot rival. Trade shows give you the opportunity to interact one-on-one with your potential clientele and attendees greatly value this experience. While trade shows provide many benefits, they also involve many complex logistics. Luckily, you don’t have to do it alone! At AFP Expo– AFP Global Logistics’ trade show-specific division–we have what it takes to ensure that your exhibit is delivered on time and according to your needs. We will customize your shipping time line based on the venue’s date and time schedule in order to ensure a seamless experience. We provide expert trade show services to clients in Washington, DC, Baltimore, and Northern VA. Get in touch with us today to find out what we can do for you! At AFP Global Logistics, we are committed to providing you with a customized logistics handling experience that places your needs above all else. 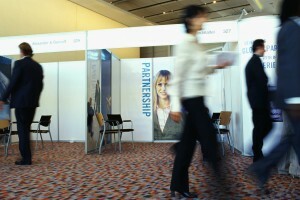 Our AFP Expo division is specifically designed with your trade show needs in mind. For more information or to start designing your own logistic solutions today, get in touch with AFP at 410.590.1234 (toll-free 800.274.1237), email us at expo@afplus.com, or fill out our quick and easy contact form here! This entry was posted on Friday, October 14th, 2016	at 7:49 am	and is filed under Trade Shows	. You can follow any responses to this entry through the RSS 2.0	feed. Both comments and pings are currently closed.